This is the first sermon of the New Year. 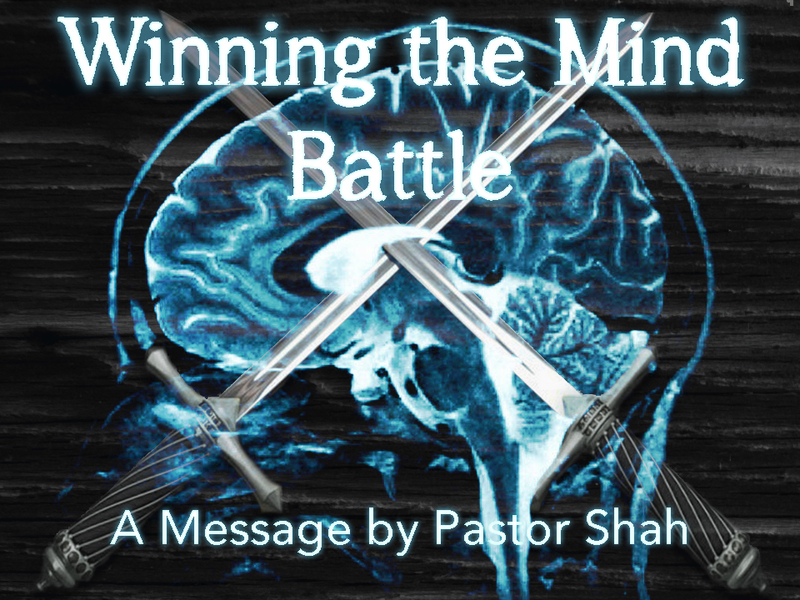 It comes from our series in the Book of Romans and it is titled – WINNING THE MIND BATTLE. I have to be honest – I really struggled with how to title this message. From one angle, this message seems to be about relationships. From a different angle, it is about overcoming evil with good. But the more I studied this passage, the more I felt that there is yet another theme that covers both of relationships and overcoming evil and that is the conversation in our mind. There is a battle that is going on here that is greater than any battle out there. Romans 12:14-18 14 Bless those who persecute you; bless and do not curse. 15 Rejoice with those who rejoice, and weep with those who weep. 16 Be of the same mind toward one another. Do not set your mind on high things, but associate with the humble. Do not be wise in your own opinion. 17 Repay no one evil for evil. Have regard for good things in the sight of all men. 18 If it is possible, as much as depends on you, live peaceably with all men. 19 Beloved, do not avenge yourselves, but rather give place to wrath; for it is written, “Vengeance is Mine, I will repay,” says the Lord. 20 Therefore “If your enemy is hungry, feed him; If he is thirsty, give him a drink; For in so doing you will heap coals of fire on his head.” 21 Do not be overcome by evil, but overcome evil with good. Overall Background: Most of our struggle as a Christian is between how we used to think before we got saved and how we should think now that we are saved. How we used to think of our enemies? How we used to think of people in general? How we used to think of ourselves? And, how we used to think of God? Now that we are saved, how should we think of each of those categories? The passage we just read covers all the relationships in our life. Would you agree that most of our problems are relationship problems? If only our relationships were running smoothly, everything would be just fine. Sadly, that’s not always the case. This morning we will look at each of them carefully – first, with our enemies, then people in general, then ourselves, and then with God Himself. We will see how we need to change the way we think about each of them. I. CHANGE THE WAY WE THINK ABOUT OUR ENEMIES. It is easy to pursue hospitality with people who welcome us with open arms. How about people who are pursuing us to hurt us physically, emotionally, and mentally? In those situations, it is very easy to become self-righteous and curse them. We feel that we are justified to pronounce a curse on our enemies. After all, that’s the old way of doing things. Love your friends and hate your enemies. But what did Jesus say – Matt. 5:43-45 43 “You have heard that it was said, ‘You shall love your neighbor and hate your enemy.’ 44 But I say to you, love your enemies, bless those who curse you, do good to those who hate you, and pray for those who spitefully use you and persecute you, 45 that you may be sons of your Father in heaven; for He makes His sun rise on the evil and on the good, and sends rain on the just and on the unjust. For e.g. There was a time in my life when I was struggling with a hurt caused to me by someone who was close to me. I struggled for a while. Even though I had forgiven this person, the hurt was deep; the wound was still raw. Then God brought someone in my life that shared with me this very passage. He said – “Pray for this person who has hurt you for the next three weeks. Pray that God would bless them and do it sincerely. Let me warn you that when you first start praying for them, you will feel like throwing up. Everything in you will churn as you try to pray for their blessing. After the first week, it will be a little easier. After the second week, it will be much easier. Then there will come a day, when you will pray and when you are finished, you will feel like a sack of stones has fallen off your shoulders.” I tried it and sure enough he was right. Every week I come across people who are struggling with hurt. Daily they are living under misery and pain. They can’t seem to break free. Here’s the answer – change the way you think about your enemies. Application: How do you think about your enemies? II. CHANGE THE WAY WE THINK ABOUT PEOPLE IN GENERAL. How contrary is that to the old way of life! We want people to rejoice with us when we rejoice and weep with us when we weep. We are the center of the universe. We want the world to revolve around us. Meaning: Look around and see where people are find ways to share their joys and tears. The problem comes when we sit around waiting for others to share our joys and tears. What happens when this does not happen? We get angry and disappointed and hurt. Change the focus from self to others and you will feel a weight lifted off you. Someone may ask – Who will rejoice with me when I rejoice? Who will weep with me when I weep? Many of us miss the blessing of having God share in our joys and our sorrows when we turn to human beings instead. III. CHANGE THE WAY WE THINK ABOUT OUR SELF. Background: Many are getting disappointed because they have such a high view of themselves. Instead, we are to set our minds on the lowly, the less fortunate. As you do that, you will find that what was once a big deal is no longer. For e.g. I’ve seen people go on a mission trip. Before they left they are all concerned about their shoes and their pillows and their hair. By the time, they are half way on the trip, they cannot find their shoes, they have lost their pillows, and hair…well… let’s not go there. The greatest therapy for your condition is to get involved with the poor, the homeless, and the hungry. Philippians 2:5-8 5 Let this mind be in you which was also in Christ Jesus, 6 who, being in the form of God, did not consider it robbery to be equal with God, 7 but made Himself of no reputation, taking the form of a bondservant, and coming in the likeness of men. 8 And being found in appearance as a man, He humbled Himself and became obedient to the point of death, even the death of the cross. Application: How do you see yourself? IV. CHANGE THE WAY WE THINK ABOUT GOD. What does that mean? Let God be God. He reserves the right to judge. He reserves the right to condemn. He reserves the right to repay. Some people have interpreted that to mean that when you do good to your enemies, it will feel burn them up. To the contrary, listen to the very next verse – 21 Do not be overcome by evil, but overcome evil with good. Paul began the application section of Romans with a clear emphasis on the mind. Listen to Romans 12:2 “And do not be conformed to this world, but be transformed by the renewing of your mind, that you may prove what is that good and acceptable and perfect will of God.” Mind Renewal is very important for our spiritual growth and victory. Before we get saved, our battle is mostly in the heart. After we get saved, our battle is mostly in the mind. If there is no life and peace in your personal life, marriage, and relationships, it is because you are still operating with the carnal mind. Now that you are saved and have the spiritual mind, you are to be transformed by the renewing of the mind. Let your thinking/thought life be transformed. All the components have arrived in the box; now put it together. Many Christians have been through a heart transformation but no mind transformation. That’s why they can’t get over old hurts and pains. That’s why they can’t seem to forgive and forget. That’s why they can’t seem to get close to people. Application: Are you ready to win the mind battle? It begins with obedience.